9th November, it is that time of the year once again. On this day, (not-that) many years ago, I was born. After turning big 3 last year, I had planned for a much quieter celebration this year with my better half. As my birthday falls on a Friday followed by two nearby public holidays, we decided to do our year-end trip a bit earlier this year and Sri Lanka was picked as the destination. Coincidentally the only available date for an affordable flight ticket was on 9th Nov itself! It is almost impossible to sleep well before a trip mainly due to excitement and last-minute preparation so we arrived at LCCT quite early for our 11am flight to Colombo. “Nak celebrate dekat Sri Lanka la ni?” and I just nodded and smiled. I thanked her for the birthday wish and moved on to the clean and nice LCCT international departure hall while tweeting about the little but sweet touch shown by the AirAsia check-in agent. I should have written down her name! Flight AK1267 to Colombo departed on time. 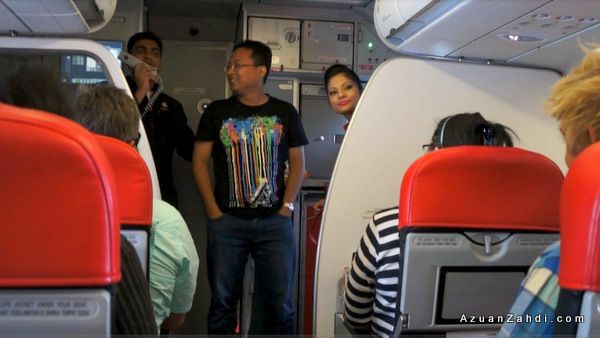 It was an almost full flight and the 4 flight attendants were all occupied from the beginning of the flight. So occupied that I was given quite a cold shoulder when I said “hi“ during boarding. 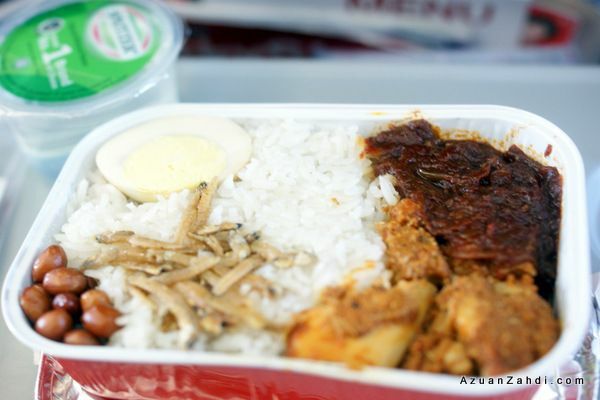 The first part of the flight was quite routine; my pre-ordered Nasi Lemak Pak Nasseer was delivered on time although the crew still gave me a cold treatment while they served. I was in a good mood so I just assumed it was a busy day for them, thankfully the Nasi Lemak tasted good. “Bring-Your-Own” in-flight entertainment works well for me. My own choice of movie & games and a much better screen than the usual in-flight screens. 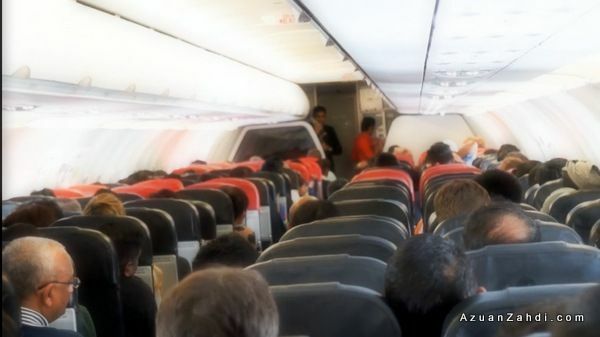 With 120 minutes to go before arrival, I took a nap as the Airbus A320 cruised above the ocean heading towards Colombo. 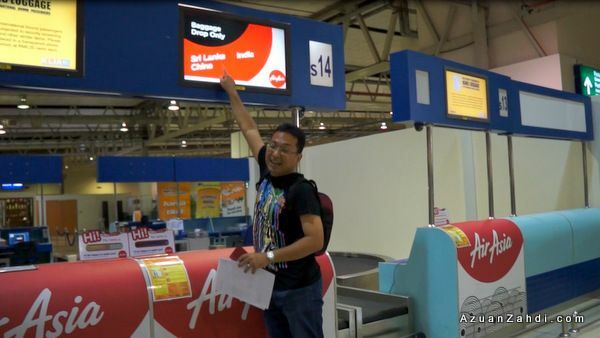 Suddenly I was wakened up by a special announcement from the lead crew Mr Ryan Shanker announcing that the flight has been chosen by the AirAsia Fun Team to host some in-flight games and activities. 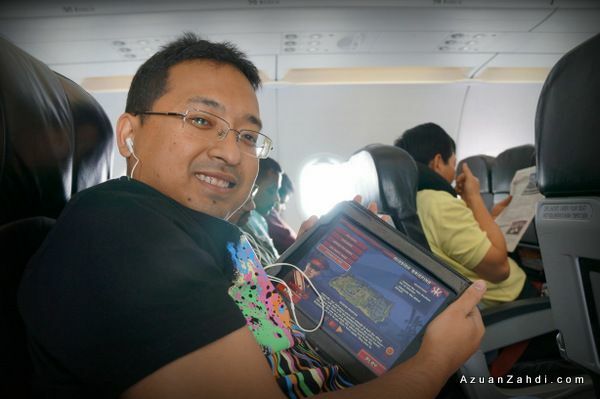 It was a brilliant way to kill time during the 3 hours 40 minutes flight and the games were quite fun. Three volunteers were chosen on the first round with all of them winning prizes for answering some simple questions on AirAsia. One cool guy even sang an almost full version of the famous Sri Lankan folk song “Surangani”. I looked at my wife and she was smiling and laughing and at that point I knew that she’s out to plan something ‘evil’ for my birthday. Not wanting to be a spoilsport, I went upfront thinking that I can easily answer those aviation-related questions. Little that I know that the whole “ignore me” and “cold treatment” earlier along with this “En Azuan, it’s your turn” thingy have all been pre-planned between the AirAsia Fun Team and my better half. 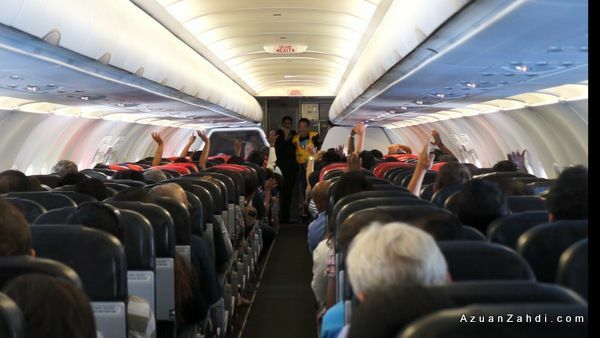 And yes, there was no such things as an easy question for me, together with 2 other lucky (or unlucky) volunteers, I was asked to perform the AirAsia A320 safety demo in front of all 150+ passengers. I wanted to just back out but the other passengers and the crew kept insisting for me to try and not wanting to let my wife down, I gave it a try! I did quite OK in a way that I can remember 1-2 things BUT still as a regular traveller I shall pay closer attention at those safety procedures and less attention on the person doing the demo. 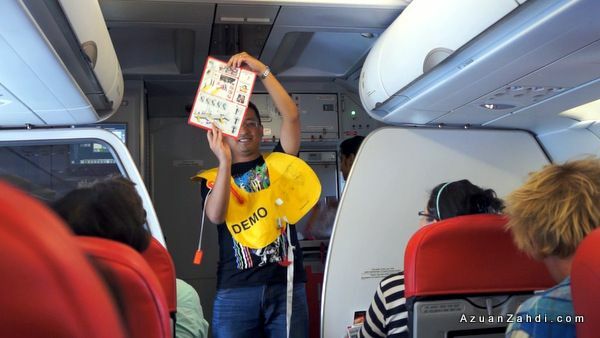 As much as I was laughing during the demo, it is a serious thing to actually know how to place the oxygen mask and use the life jacket properly. 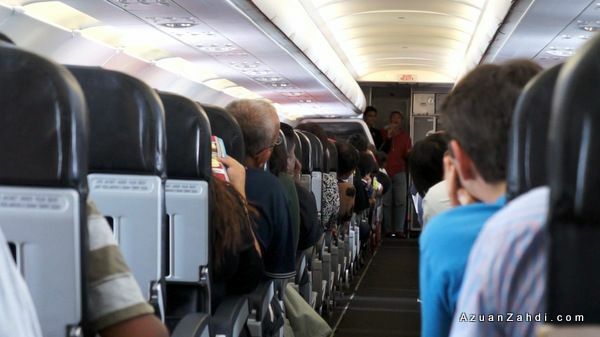 Pay attention the next time you fly. Thanks to the favourable show of hands, I was announced as the best among three ‘volunteers’. As I was about to return to my seat, Mr. Shanker announced that it was my birthday and they had a surprise for me. I got confused for a while thinking that asking me to come forward was the surprise part. 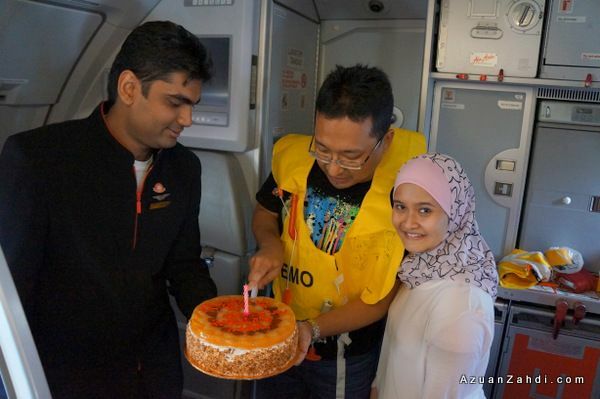 And from the galley my wife – Jiji and two other crew members walked towards the front part of the cabin carrying a cake while almost all the passengers sang the birthday song. It was one of the moments that I cannot easily described with words. I am touched by the trouble that my wife and the crew went in getting this things planned. A souvenir from the crew. This will definitely go into my aviation display at home. I’ve compiled some scenes from the flight to best showcase the memorable birthday celebration. Enjoy the video at HD for best viewing experience. 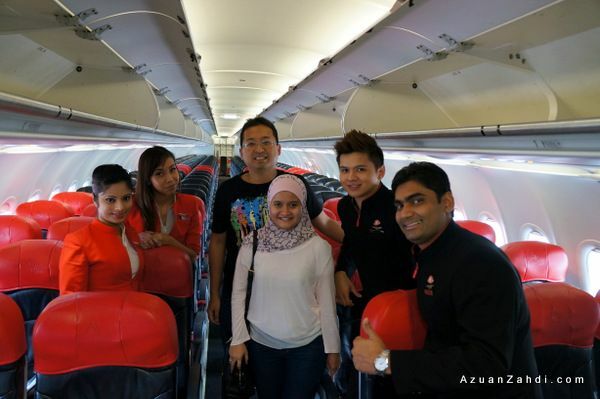 A special thanks to my other half, the crew of AK1267 – 9th Nov 2012, AirAsia fun team, Mr Faisal and all the passengers for making the flight a very memorable one. do they do this to ALL travellers who travelled on their birthdays? anyway, happy belated birthday! so sweet la your wife! Hahah i think it is by request and coincidentally the flight was chosen to have some in-flight fun activities so the ambience was there for such celebration. The cake? Yes we had to pay for it but we got the whole cake which we shared with everyone since it would be tricky to bring it with us. I would like to plan a surprise for my friend. But i wont be travelling with her. Do you have any clue? Wow, a sweet wife you have there Azuan. 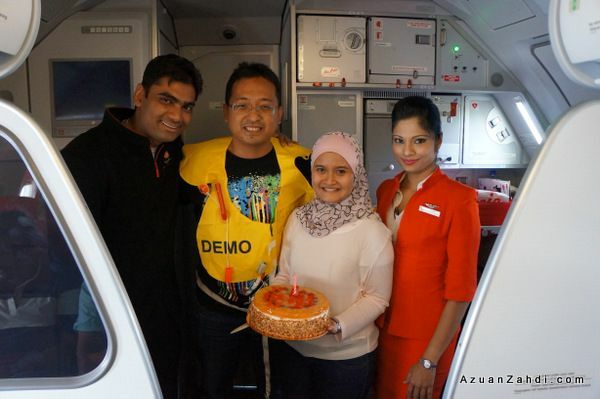 Comel gila Jiji plan all those tricks on your birthday dgn Airasia Fun Team. Sgt sweet!! Hope you two had a blast on your trip to Sri Lanka. p/s: Send my regards to Jiji. Excellent birthday plan. Hahaha. 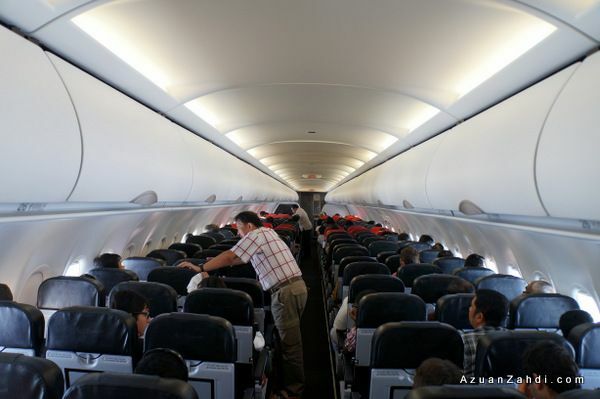 Next time sky dive dari Airasia flight pulak kot. Thanks Farah 🙂 Memang sangat terkejut and sangat terharu with the surprise. Caught me of guard. best kak especially kalau minat nature, wildlife, beach and curry! Hi Mr. Azuan, thank you so much for the compliments. 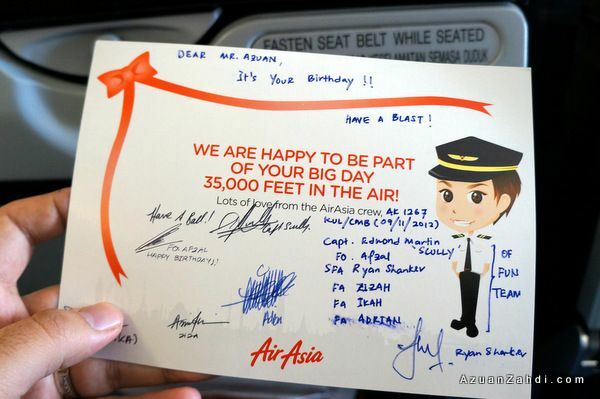 On behalf the Air Asia Fun Team, its a real Honor for us to celebrate you, on the returns of your day esp on board 34,000 feet above. 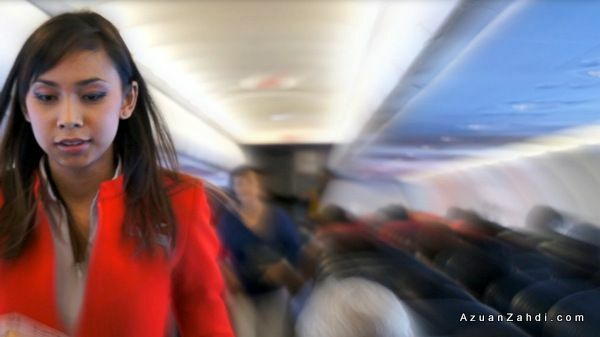 By the way, the safety demo is actually a part of my game plan which I will always implement on my inflight events, as it is for the guests, to go about on the importance of safety awareness on board while having fun. Anyway the photo shots is awesome, My best regards and God Bless..
thank you Sir! the best birthday celebration ever for me. and kudos to you fo creating awareness on the importance of safety demo through your reative inflight events. hai Ryan Shanker, we have met before on a flight from AOR-KL 13/10/12. happy birthday!!! that’s really an awesome surprise!!! Glad you enjoyed your birthday and the flight. I’m terrified of flying!!! thanks! nothing to be worried about flying. Murah rezeki ada isteri yang sangat kool & sweet. 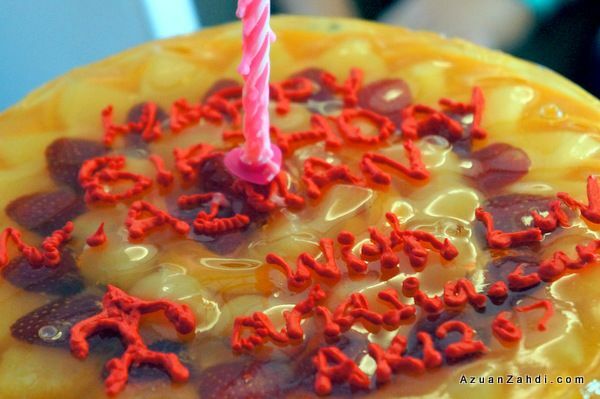 Very sweet of Air Asia……… but hmmm…… isn’t their name mispelt on the cake?! 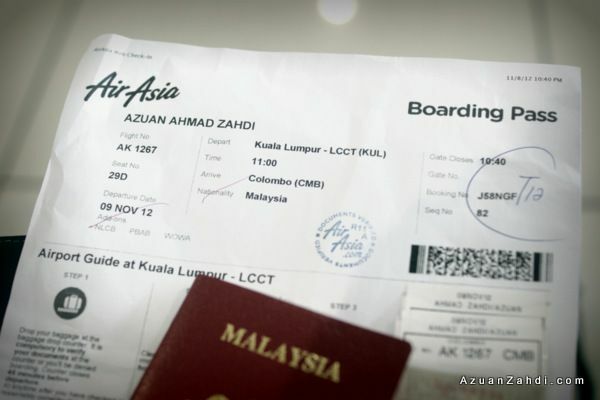 I seem to see it as Ari Asia, instead of Air Asia! And it’s a bit strange that the cake bears their name, as if they presented it to you FOC, but then they charged for it?!? May i know how did u arrange with the team for this surprise celebration? I’d like to plan one too for my mum. Thanks in advance! I would like to have the same experience as what you did. Coz i intend to suprise my wife on board airasia flight on her birthday. Care to share how you/your wife get it done?